« Black hole ejecting massive wind? According to recent research by Christine D. Wilson of McMaster University, Arp 220 is an ultra-luminous galaxy with a very compact nucleus, surrounded by a star-forming region only 3,000 light years across, and having two supermassive black holes separated by only 1,000 light years. The conventional explanation is that it has formed through the merger of two pre-existing galaxies. Concentrated in this small region, the star formation rate is 200 times that of the Milky Way whose core region is much broader, spanning some 60,000 light years. Furthermore, this central region is riddled with a large population of what is thought to be relatively young globular star clusters, which would cause this galaxy to appear 50 times brighter than the Milky Way if the core region were not heavily obstructed with gas and dust. Wilson has noted that globular clusters seem to form mostly in dense gas-rich regions, and others have noted that massive clusters form most efficiently in the most active star-forming systems. So it does not seem unexpected to find that Arp 220 contains so many young massive globular clusters, molecular gas within just 2500 light years of this galaxy’s cores being concentrated to a surface density similar to that found inside a giant molecular cloud. I disagree with the interpretation that the two cores in Arp 220 are an example of two galaxies colliding with one another. Christine Wilson is giving the standard interpretation, which I feel is as far from the truth as one can get. In reality, we are seeing just the opposite. We are seeing an example of two cores that are in the act of separating from one another. Such a core separation phenomenon is predicted by the continuous matter creation cosmology of subquantum kinetics. I propose that this galaxy initially had a single supermassive galactic core, and that not long ago when the core was in an active quasar-like state it explosively fragmented to form the two cores we see today. Halton Arp, the discoverer of this galaxy, would most likely agree with this view as he has previously discussed evidence that Arp 220 has been ejecting supermassive quasar bodies from its core; see http://iopscience.iop.org/1538-4357/553/1/L11/pdf/015086.web.pdf. Observations with the Chandra X-ray telescope show giant lobes of hot gas extending out 75,000 light years from this galaxy and believed to have been ejected by past activity in its nucleus. See: http://chandra.harvard.edu/photo/2002/1181/. The explosive AGN activity ejecting this gas could have been the same that resulted in the fissioning of Arp 220’s core. If we figure that this gas was part of an ultra fast outflow that moved outward at an average speed of 0.2 c, this ejection would have begun around 380,000 years ago. In this period the fissioning cores could have journeyed to their current 1000 light year separation if they have a velocity relative to one another of ~800 km/s projected in the plane of the sky. I believe we are witnessing a case where a single supermassive core has recently divided into two, somewhat like cell division, but with a lot of energy thrown into the mix. There aren’t two galaxies here, just one irregular elliptical galaxy, and it is not a very large one. Its long dimension is about 9,000 light years and it is estimated to have a mass of about 10 billion solar masses. So basically its size is small enough to fit inside the Milky Way’s galactic bulge. We might regard it as a medium sized elliptical galaxy (larger than a dwarf elliptical) that is in the process of expelling gas that will one day form its spiral arms. Hence it is in the process of evolving into a spiral galaxy in the far future. Each core is surrounded by its own disc of closely bound stars orbiting within a few hundred light years of each core and these are seen to be embedded in a single common disc having a diameter of ~7,000 light years. If these were two colliding galaxies, as most astronomers claim, we should instead expect to see these cores embedded in two outer discs, not one. Since we don’t, we are left to conclude that at an earlier date there was just one galaxy and one galactic core, which now has divided into two. The picture below shows how this disc is laid out. 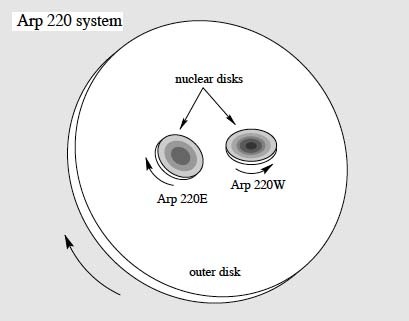 One thing we note here is that the two nuclear discs are seen to be counter rotating with their axes approximately in a parallel-antiparallel alignment. Now, if these were colliding galaxies, we would have to interpret this as a pure coincidence (if you figure the odds for this particular alignment, they are fairly small). On the other hand, a single nuclear disc separating into two, due to a central core division, would by necessity have to have this kind of counter rotating alignment for reasons of conservation of momentum. That is, the stars orbiting each core on the side nearest to the partner core in each case will necessarily have to be traveling in roughly the same direction; the stars that were initially orbiting the progenitor primary core are not going to pull a U-turn huey in interstellar space to go around the new born twin core in the opposite direction! Rather, they would take the path of least resistance and simply deflect to go counterclockwise around the partner core instead of clockwise around the primary core. If the cores were closer in the past, as the ejection scenario suggests, this consideration of the orientation of the velocity vectors in each nuclear disc would have been even more important. So, seeing the discs with this particular rotational configuration relative to one another is pretty much smoking gun evidence that we are observing core fragments that are separating and not merging galaxies. Given that our knowledge is limited by the fact that we were not around half a million years ago to see if the cores were closer together or further apart, we are forced to settle for the evidence at hand, and looking at it in an objective fashion leads to the conclusion of separation, not merger. Also I believe it is wrong to refer to these cores as black holes. As I have discussed in previous postings, these are better thought of as supermassive mother stars, highly dense, noncollapsed bodies that create matter and energy in their interiors and explosively eject this created matter and energy to their environment. As you mention, astronomers have found a large number of massive globular star clusters in the immediate vicinity of these cores which contain many massive “young stars” e.g., blue giants, supergiants, Wolf-Rayets, etc. As I have said before, blue giants and blue supergiants can be old stars if they have formed by growing in mass from formerly less massive stars on the main sequence. However, they could also be young, in accordance with the conventional assumption, if they have formed recently from gas and dust accretion, which is likely in this case since this region is well stocked with dust and gas. It is my opinion that the large quantity of gas in Arp 220, which has resulted in the recent formation of these globular clusters, has all been created in these active cores and ejected from them in the past and that none of this was brought into the system by some hypothetical “colliding galaxy”. A massive outflow of warm hydrogen gas from the core region has been detected. Wilson concludes that the energy source heating this gas must be non-ionizing, and is likely mechanical energy from stellar winds and supernovae. However, she offers no explanation for the source of this mechanical energy. And recent observations suggest that a hidden AGN is likely present, being necessarily present in order to power the observed luminosity. Particularly noteworthy, the massive outflow from the core is observed to have a relatively low velocity, and to be unable to escape the central nuclear region of the galaxy. Given these observations, it seems likely that this is an example of a galaxy whose growing core has developed conditions that greatly accelerate it’s growth over that of a more typical galaxy. Can this be due to a prior galactic collision which has brought the two cores into close proximity, enhancing the etheric conditions in the central core needed to nucleate new matter? In any case, it seems that the compact core has ejected so much gas and dust into the immediate core region, which has served as a positive feedback mechanism, to create the conditions for massive outflows and the formation of nearby young star clusters. The energy powering the molecular hydrogen gas outflow that Wilson has observed can easily be explained by interstellar gas winds driven outward by cosmic ray volleys (galactic superwaves) emitted in the past by the active core of Arp 220. Such gas outflows are commonly seen in Seyferts and other active galaxies. So instead of supposing that these winds originate from stars or supernova explosions, I think a more logical candidate is emission from the active cores in Arp 220. Again, in my opinion, it is doubtful that we are seeing any kind of galaxy collision here. This is more likely a core ejection. Such ejections presuppose the existence of extremely energetic conditions in the parent core for fragmentation to occur. The energy source is simply the core itself which continually produces genic energy (see subquantum kinetics for an explanation). Because conventional astrophysicists do not allow themselves to violate the First Law, they invoke accretion onto a black hole as the preferred energy releasing mechanism to explain these outflows and the energetic core activity. This biases them to interpret this galaxy system as a system in mutual collision. In fact, there is no evidence to prove that galaxies are colliding. Astronomers are making this assumption based on convenience. When the facts are considered more objectively, they favor ejection, not collision. Consider the observed gas outflow which currently has reached out 75,000 light years which we suggested was expelled by core activity that began about 400,000 years ago. If we surmised that these galaxies are colliding and that they approach one another at say 800 km/s, then 400,000 years ago when this outburst took place they would have been twice as far apart with far less likelihood of any strong interaction. Why then would that gas have been emitted if that was the case? This is an example of some of the loose ends that the collision theory suffers from. Given the recent observations of massive fast moving outflows from stellar-mass core stars, is it reasonable to assume that the next stage for Arp 220 will be that the outflows will grow in magnitude until one or both cores are laid bare, shutting off star formation in the central region, and leaving the outer portions of each galaxy to locally disperse themselves? And would this subsequent condition be one type of active galactic nucleus, an isolated galactic core forming the basis for spawning new galaxies nearby, and thereby eventually forming a small cluster of galaxies, such as is seen in the immediate vicinity of II Zw 096 discussed in this link? The cores do not currently appear to be in their active state since we see a massive molecular hydrogen outflow in this region. The strong cosmic ray flux emitted from an active galactic nucleus would instead have ionized this gas. Such activity was likely present hundreds of thousands of years ago when the progenitor supermassive core was in the process of dividing. However, it is possible that, as these two cores grow in mass, they will eventually enter an active state and produce an intense cosmic ray wind such as is seen in active galactic nuclei. This could produce a far more powerful outflow that could clear out much of the gas and dust from this inner region to form an outer gas ring similar to that seen in ring galaxies or similar to the molecular ring seen in the Milky Way. The expulsion of gas from the inner portion of the galaxy would likely shut off star formation there. But star formation would likely continue in the vicinity of the ring that would form. According to subquantum kinetics, the core, or cores, could continue their activity for a considerable period of time even with no gas being present in their vicinity since the energy they would be generating would not be due to black hole accretion. Rather it would be genic, spontaneously generated, due to the supercritical conditions prevailing within them. As for your last question, yes this type of core fragmentation could result in the formation of a group of satellite galaxies, if the process of core separation and ejection were to be repeated in the future. Such explosive expulsions could also help generate spiral arms around this parent elliptical, transforming it into a spiral galaxy, or into a larger galaxy having a peculiar shape if its violent outbursts were to continue.